The Thermo Haake DC 10 Circulator gives you versatile operation in a single unit that’s easy to use and has a small footprint. This lab water bath can be used with non-combustible liquids such as water or water with antifreeze. This microprocessor controlled Recirculating Water Bath has a bright easy to ready LED screen that shows current temperature and pump speed and can store up to 3 user defined settings for reproducibility. This recirculating water bath can pump up to 17 liters per minute and has a maximum pressure of 300 mbar. The Thermo Haake DC 10 Circulator comes with the K10 water bath reservoir that can holds up to 3 liters of liquid. This immersion chiller partnered with this compressor water bath has a temperature range of -10° to 100°C. 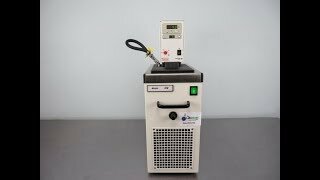 A recirculating water bath is especially useful for electrophoresis cells, viscometers, chromatography columns, general lab cooling and many others. This circulating water bath also comes with a variety of safety measures to protect both samples and users, such as audible and visual alarms, motor overload protection, setting limitations, back up thermostat. This Thermo Haake DC10 Recirculating Water Bath has been thoroughly inspected and is performing to expectations. All of our lab equipment comes backed with our standard warranty. Should you have any questions, please don't hesitate to contact us.